‘This motorcycle is 70% track ready!’ claimed Sarath after riding the BMW F 750 GS at the track. Of course, we were taken aback by this claim. So, just to double-check, we rang the folks in race control to confirm its best lap time – ‘1:12.4,’ came the reply. Now, if you don’t have time to check our entire list of times, that means it’s just 0.4 of a second off the Ducati Multistrada 1260 Pikes Peak – a sporty ADV that’s more than twice as powerful. So, how did this happen? To put it simply, there’s nothing extraordinary about the F 750 GS. The engine, for instance, is an 853cc twin-cylinder unit that pushes out 76.4bhp and 83Nm. It comes mated to a six-speed transmission with a slipper clutch. Even the chassis doesn’t have any special equipment – there’s a conventional front fork and a mono-shock at the back, albeit the latter is adjustable for both pre-load and damping. The 19-inch front and 17-inch rear tyre come with alloy wheels, since the 750 is mainly a road bike that can also be taken out for some light off-roading. ‘Everything is average, but the end result is greater than the sum of its parts’ – this is what Sarath said about the 750. And he’s absolutely right. You see, the engine is super refined with a very strong surge of power flowing in the low- to mid-range – it only slightly flattens towards the top. The gearbox is a gem – the shifts are precise and flawless. In fact, Sarath noted that even aggressive downshifts won’t unsettle the bike as the slipper clutch works wonders. That meant he had a tough time keeping track of the gears while shifting down, because the transition is so smooth. But its biggest highlight has to be its handling. Despite being an ADV, the F 750 GS is phenomenal around corners. The damping is perfect, the brakes are sharp, and it took to the track like a duck to water. Quick switchbacks, long flowing corners and long straights, the F 750 GS impresses everywhere. The F 750 GS was one of the biggest surprises this year. And we felt that it could even have been among the ‘Best of 2018’ had its elder sibling, the F 850 GS, not been around. 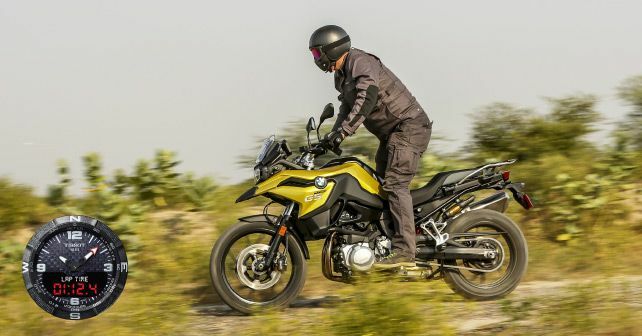 You see, the latter looks more appealing, offers more equipment and better performance – both on- and off-road – and comes at a very slight premium over the F 750 GS.